﻿ book pick: in my backyard. book pick: in my backyard. As we aim to make more earth-friendly choices in our household, I hope I’m able to teach my little one the importance of taking care of our world. These friendly books might be a great start for him. 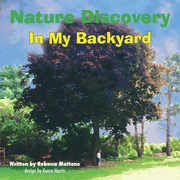 Newly created by The Little Environmentalists, the books encourage toddlers to become aware of all the wonderful things about the earth, starting in their own yard, using multiple senses. << nicole CARMAN photography winner!